The American Battle Monument Commission (ABMC) was created by act of Congress in March 1923 to « … erect and maintain memorials in the United States and foreign countries where the United States Armed Forces have served since 6 April 1917. To control, to design and provide regulations for the erection of monuments, markers and memorial in foreign countries by other United States citizens and organizations, public or private … » It was later given responsibility for establishing or taking over from Armed Forces permanent burial grounds in foreign countries. During WWII, on the European Theater of Operations (ETO), 55 temporary cemeteries were established by Grave Registration Service units. The location of these temporary cemeteries essentially depended of the military situation. Major battles generated urgent needs of burial grounds where casualties, allied and German, were sometimes buried at the same location. As a result, cemeteries were also established close to major field hospitals. 27 of those temporary cemeteries were located in France, 4 in Belgium, 3 in Holland, 2 in England, 16 in Germany and 1 each in Ireland, Luxembourg and Switzerland. Another 51 temporary U.S. military cemeteries were established in the regions surrounding the Mediterranean: 20 of them on the Italian peninsula; 14 in Africa; 10 in the islands in the waist of the Mediterranean (Sicily, Sardinia, Corsica and Malta); and the remaining 7 in the Balkans, stretching from Greece through Bulgaria, Yugoslavia, Hungary and Rumania. Burial in Henri Chapelle cemetery, 1944. 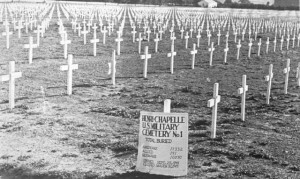 The region of Henri-Chapelle, Belgium, was liberated on September 11, 1944 by troops of the 1st Infantry Division.Two weeks later, on September 25, 1944, Captain Channing B. Rennie, Jr ‘s 603rd QM Grave Registration Company established a temporary cemetery on a hill crest 2 miles north west of the village. This coincides with the first casualties sustained by the VII US Corps in its fruitless attempts to breach the German lines in the Hürtgen Forest. 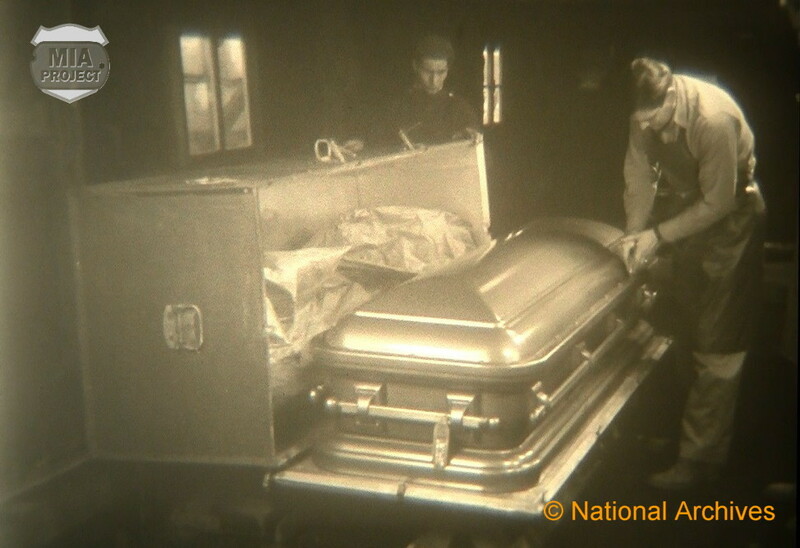 Later on, soldiers fallen during the Battle of the Bulge or during the advance into and across Germany during the winter of 1944-1945 were brought back to Henri-Chapelle. 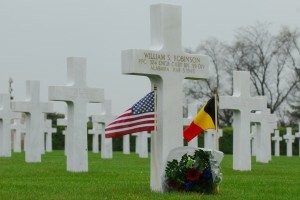 In the spring of 1945, the cemetery contained over 17600 American graves. In addition, there were also 10600 German and 191 British, Australian, Polish, Canadian and Belgian soldiers. 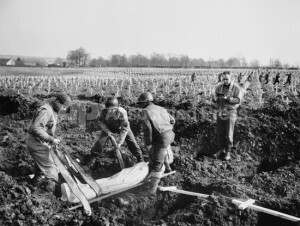 At war’s end, Congress authorized the War Department to take steps to provide a reverent final burial for those who gave the last full measure of devotion. In 1947, the Secretary of the Army and the ABMC selected 12 sites as permanent cemeteries, each rich of symbols and history. Sacred ground for those who perished in the Hürtgen Forest and during the Battle of the Bulge, Henri-Chapelle was among the selected cemeteries. Neuville-en-Condroz was the second permanent cemetery in Belgium. In May 1947, General Dwight D. Eisenhower presided the first Memorial Day held in Henri-Chapelle. The Belgian population and local veterans associations massively attended the ceremony. The repatriation program began on July 27, 1947. The cemetery was closed to visitors and the disinterment procedure started. 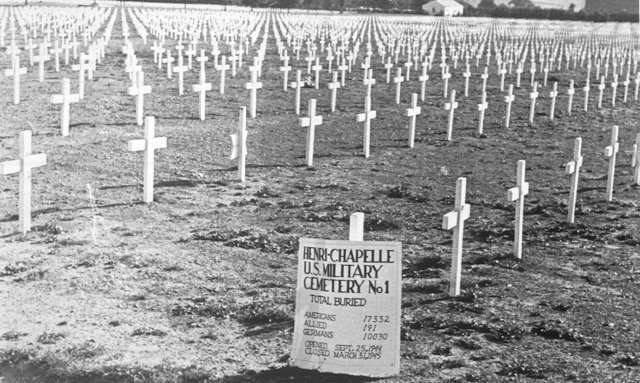 It was from the temporary cemetery at Henri-Chapelle that the first shipments of remains of American war dead were returned to the United States for permanent burial. Boxed remains brought to the forensic tent for identification. Exhumation was an arduous task to accomplish. The next of kin of a deceased soldier was given three burial options. -The remains may be returned to the US, or a foreign country, homeland of the deceased or next of kin, for interment in a civilian cemetery. -The remains may be returned to the US for interment in a national cemetery. -The remains may be interred in a permanent US cemetery overseas. The government of the United States was bearing all the costs of exhumation, preparation of the remains, casketing, transport and reburial. If a private cemetery was selected, the US government was assuming transportation to a funeral director designated by the next of kin and contributed a sum not exceeding $75 as defrayment for re-burial expenses. Remains selected for States side burials were flagged and disinterment process started at a large scale. 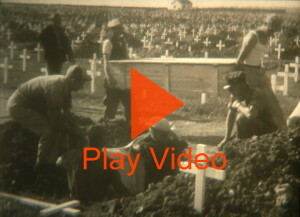 After being exhumed by Belgian workers, the remains were carefully controlled by Grave Registration Service personnel to confirm identification. 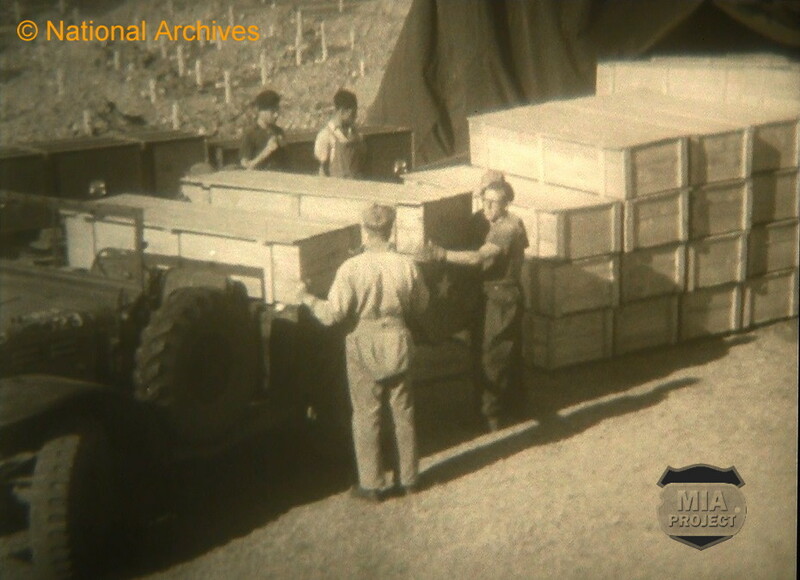 Boxed, casketed and placed in a transportation container, the remains were trucked to Liège harbor where they were loaded on barges. Using the Albert Canal, they reached the port of Antwerp where the boxed caskets were transferred on US Navy ships for the long return home. The first shipment of 5,600 American war dead from Henri-Chapelle left Antwerp, Belgium the first week of October 1947.An impressive ceremony was held, with over 30,000 Belgian citizens attending, along with representatives of the Belgium government and senior Americans. Over the next two years, temporary cemeteries closed successively and by the end of 1949, permanent interments were virtually completed. 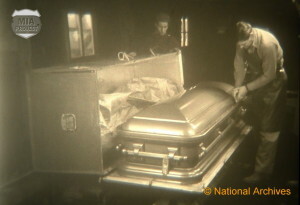 Servicemen remaining in overseas cemeteries received the same preparation. For the average visitor, the tombs seem to have been dug separately at the base of perfectly lined marble crosses. The reality is very different. Cranes excavated large holes representing the different plots. Boxed caskets were then placed at the bottom and lined properly to have headstones perfectly displayed in large and beautifully curved lines. 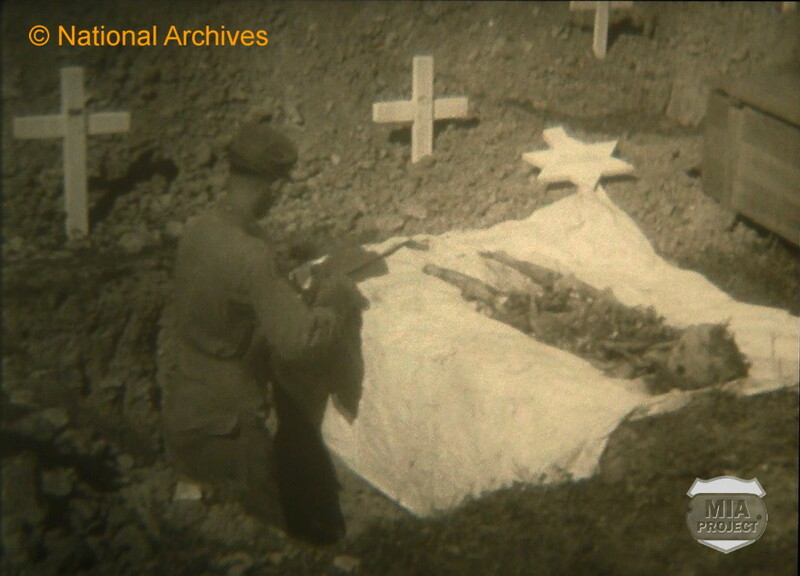 Overseas cemeteries were progressively transferred for construction and maintenance to the ABMC. Architects for the cemetery of Henri-Chapelle were Holabird, Root and Burgee of Chicago, Illinois. The landscape architect was Franz Lipp, also of Chicago. The temporary wooden Christian and Star of David grave markers were replaced by their equivalent in pristine Italian white marble. The cemetery, its memorial and chapel were completed in 1960 and its 7,989 graves extended on 57 acres. The grave area is dominated by the bronze statue of the Angel of Peace bestowing the olive branch upon the heroic Dead for whom he makes special commendation to the Almighty. Among the graves are 35 instances in which two brothers rest side by side and one instance of 3 brothers, also there are headstones marking the tombs of 94 unknowns and three Medal of Honor recipients. Twenty-two of the eighty-six American prisoners massacred by the Germans at Malmedy also rest here. 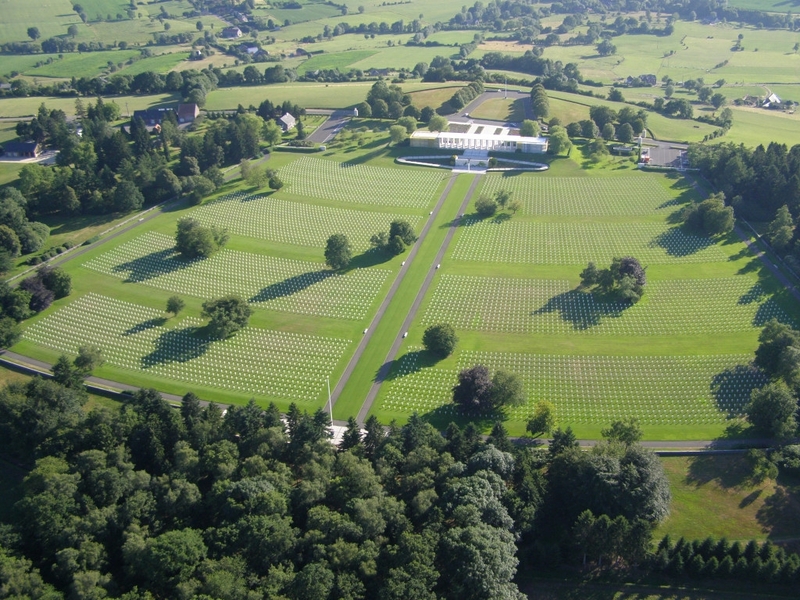 After the completion of the cemetery, no burial occurred in Henri-Chapelle until June 22, 2002. That day, three soldiers of the 99th Infantry Division, reported missing in action during the Battle of the Bulge and recovered in 2001 by the MIA Project team, were buried with full military honors (see Recovery on 88 Hill and California Road). This increased the total of graves to 7.992. 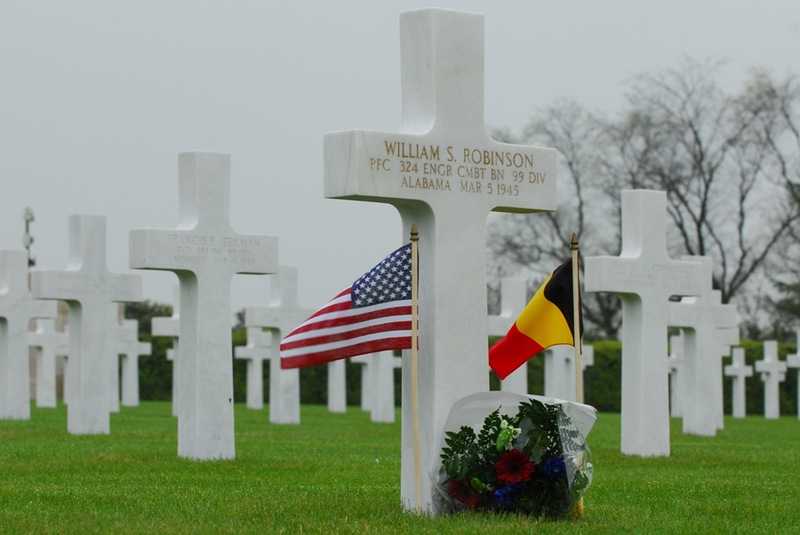 Belgian school children visit frequently to pay their respects and to learn about the Americans who liberated their country in World War II. Many graves were adopted by locals and contact established with American families. After all those years, the Belgian population has not forgotten. The memorial has a visitor’s room and maps depicting military operations in the region. A small chapel provides a place for quiet reflection. Carved on 12 pairs of columns on the memorial plaza are the names of 450 missing servicemen.